The thing I like about getting bags to review, other than satisfying my constant craving for new bags, is the way in which different manufacturers approach design. Essentially, it's about working out how to wrap heavyweight materials around your DJ gear and keep it safe, and each one has its own particular way of working. UDG have gone for solid and chunky, perhaps at the expense of space. The SlingBag set isn't the biggest set I've ever come across, but will possibly be one of the hardest wearing. But you get what you pay for - this set isn't cheap, but I've learned time and time again that spending a little more for quality is worth it in the end. Find out more in my review right here. Nice review Giz! But I can't help but wish that UDG would have sent you a more "uptodate" bag/set of bags to review. UDG SlingBag Trolley Set Deluxe used to be the bags to have - but that was before DJs started lugging laptops, soundcards, controllers and the likes to gigs instead of vinyl records. As nice as those bags are, unless you take out the padding you can't even fit a 13,3 laptop nore a 15,4/6, so..as I said nice review but those bags and what they were intended for just don't seem to matter much these days for the working DJ on the road! So please UDG send Gizmo sth like the UDG 22" trolley or sanything else more current! @ R2D2 - The word is "similar bags"...I used to own the exact bag set that Gizmo wrote about and without removing the padding you can't fit normal sized latops into the bag. And a bag without padding....not so great. I'm sure the ableton DJs you saw used UDG trolley but I'm just as sure that it wasn't this model. UDG has a gazillion different trolleys most of which have special laptop departments but these ones well...they were strictly and pretty much only designed for transporting vinyl! I'm with R2D2 on this one (not to say Strategy is incorrect). I know a quite a few Traktor and Serato DJ's that use the sling bag trolleys who haven't got a bad word to say about these bags. They use 13" mac-books normally and they seem to fit a wide range of gear in them, from midi controllers and audio interfaces to back up CD's or vinyl's. Stategy is right in the fact that, yes these bags will struggle with the larger laptops on the market, but even though these were originally for vinyl, they still have a variety of uses for other equipment/media. 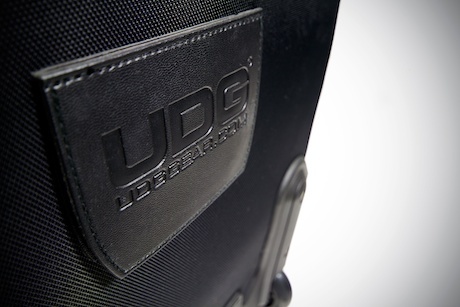 When I'm using Traktor at a Gig i use the UDG U9011 bag (Look it up, its awesome!!) it fits a missive amount of gear in it. - a few bits like torches and little things like that. As you can see, quite alot of stuff can fit.. Definitely worth a look at if someone is after something other than a trolley bag.